To celebrate the completion of the project and highlight its results, the project team is organising an event on Thursday 18 May 2017. The event starts at 17:30 at Akrotiri Marsh with the inauguration of one of the birdwatching hides (north side of the site) which was built as part of the project. The event will continue at the Akrotiri Environmental Education Centre at 19:00 with a presentation on the challenge of managing the Akrotiri Peninsula and the threats it’s facing and a presentation on the restoration project at Akrotiri Marsh. 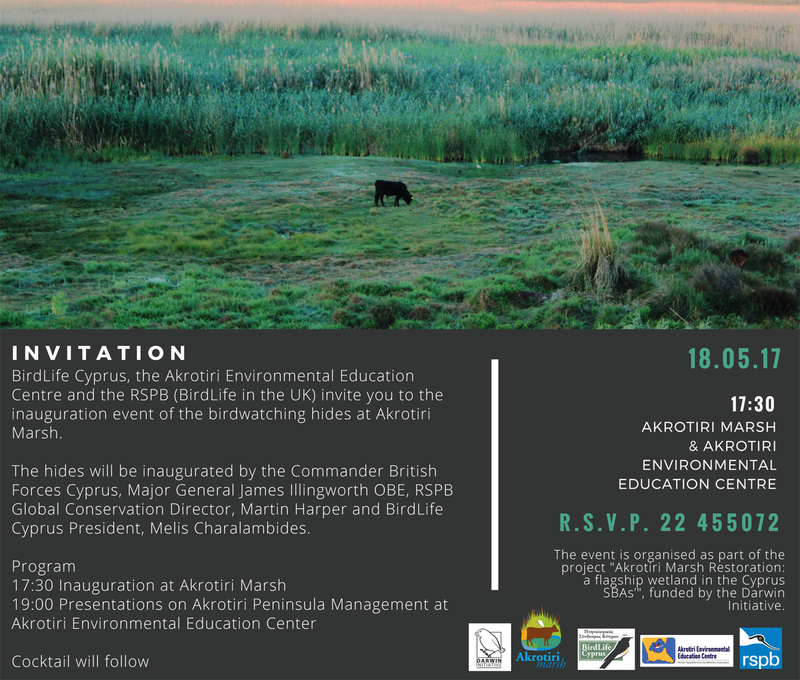 Join us to celebrate the completion of the project for the restoration of Akrotiri Marsh and enjoy birdwatching from the new facilities. At the event you will also have the opportunity to learn about the project’s achievements and the future of Akrotiri Marsh as well as the significance of Akrotiri Peninsula for wildlife and the challenges of protecting it. The hide will be inaugurated by the Commander British Forces Cyprus, Major General James Illingworth OBE, RSPB (BirdLife in the UK) Global Conservation Director, Martin Harper and BirdLife Cyprus President, Melis Charalambides. Please let us know if you are attending by contacting BirdLife Cyprus on 22-455072 or on melpo.apostolidou@birdlifecyprus.org.cy.